Disinfection of surfaces, floors, walls, materials. Meets standards EN 1276, EN 1650 and EN 13697. Broad spectrum disinfectant effective against bacteria, yeast and mold, spores and viruses. Effective against Salmonella, E.coli & Listeria. Free of chlorine, quats and alcohol. Biodegradable, splits into water and oxygen. Extended re-use of process water. Leaves no harmful residue which might compromise the quality of the end product. Has no influence on the end product: odourless, colourless and tasteless. Shelf-life extension: improves freshness and sell-by date. 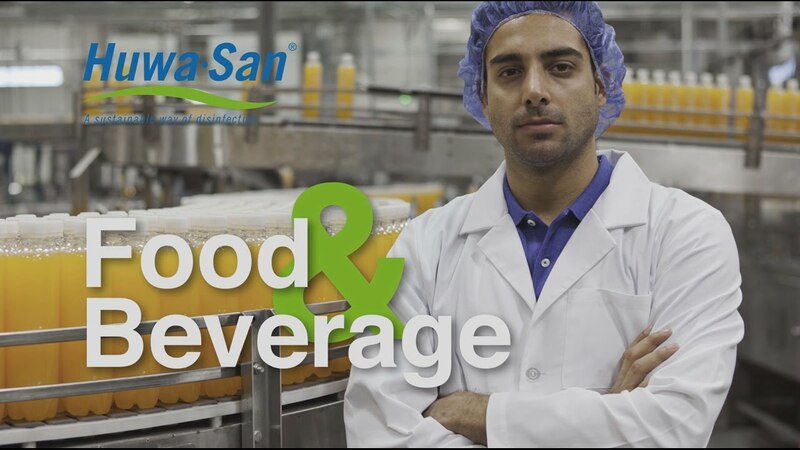 Watch this video to learn more on our Huwa-San Food & Beverage disinfectant product.